Kids Can Press, 9781771380515, 32pp. The old zookeeper has no idea how much trouble it will cause when she moves the monkeys into a cage near the picnic and play areas. Now the monkeys can watch the children up close, and they find the children so fascinating that before long, they start behaving just like them! Mother Monkey is not amused. When she sees her little monkeys chewing with their mouths closed, she demands to know what's going on. ?We are using good manners,? they say. 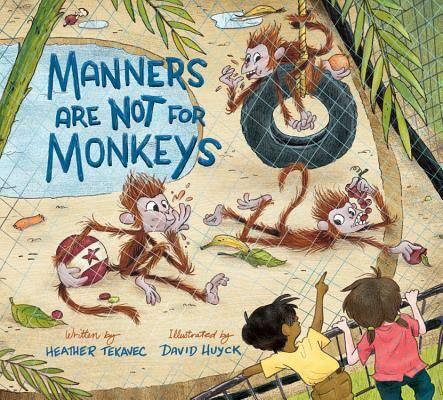 ?Manners are not for monkeys,? Mother tells them. But it's no use. In fact, her little monkeys won't do any monkey things anymore --- no more swinging all at once from the branches, screeching or tossing their banana peels on the ground. Is there anything Mother Monkey can do to get them to behave like ?good little monkeys? again? Heather Tekavec first fell in love with children's literature while working as a preschool teacher. Different? Same! is her eleventh published book and her first nonfiction picture book. Heather lives in Cloverdale, British Columbia.